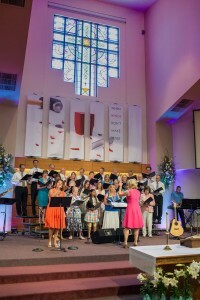 High Schoolers through adults are welcome to join the PLC Adult Choir during its Easter and/or Christmas season. We normally meet weekly over 2-3 months in the spring and fall in Room A204. Easter Chorus prepares music for Holy Week and Easter. The Christmas Chorus prepares music for Reformation Sunday, pre-Thanksgiving, a “musical message” in December and for those who can continue, special selections for Christmas Eve. If you enjoy singing, the choir is the place to be. Rehearsals are a time of learning music but even more than that, they are a time of laughter, of sharing and of deepening our faith in Jesus Christ. Each rehearsal ends with a brief devotional given by various members of the choir. For more info, contact Director of Performing Arts, Adele Buffington.